"Gold for immediate delivery in London rose to an all-time high of $1,462.30." 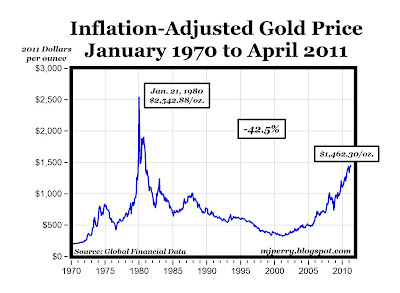 The chart above (click to enlarge) displays real, inflation-adjusted gold prices back to 1970 (data are from Global Financial Data, paid subscription required), and shows that the real price of gold peaked on January 21, 1980 at a closing price of $892.10 per ounce in current dollars, but that's more than $2,500 per ounce in today's dollars. Compared to that peak real price, the price of gold today at $1,462.30 per ounce is 42.5% below the 1980 peak. I get a kick out of the gold ads. First senrene the tell you how much purchasing power the dollar has lost. Second se te ce the tell you how much the dollar price of gold has gone up. Gold Nuts: Look at that chart very carefully. If you bought gold in the last fever, around 1980, you would still be way down on your "investment" and would have received no dividends or interest or rental income along the way. You would be a big loser. El Chump. The Sucker. Can gold go higher now? It all depends on 2.5 billion Chinese and Indian buyers. That is where the bulk of gold is sold, for jewelry. The world is changing. They don't care about Bernanke, QE or the CPI. They are buying gold and baubles for Mom, Auntie, the hot babe. So, gold could have a long run. Or maybe not. You could lose half your capital in the next 30 years. My guess is gold is old. And we are looking at a 20-year bull in equities and property on tap. The party-boom in the Far East will make all previous booms look like tea-and-crumpets at Grandma Mildred's. And your and your gold? A side-show. Back in September the price of the dow, in gold, was at or near an all time low. Anyone know what it is today? Far more moving parts than in 1980. I wouldn't rush into PM now, but since I began buying when Lehman collapsed i can still be a buyer now. Thinking maybe new money should go into geiger counter manufacturing. You would have done a lot better buying AIG after Lehman collapsed, I think. Then again, maybe not. I wonder if AIG re-insured Fukushima? Buying commodities is one way to hedge some of your currency exposure. Those Americans who bought gold in the late 70's may have lost on their gold bet, but they won on their dollar exposure as the dollar strengthened. There are reasons other than speculation to maintain a position in an asset. BTW, the trajectory in gold may be telling us something very unpleasant about inflation expectations. "BTW, the trajectory in gold may be telling us something very unpleasant about inflation expectations." "I get a kick out of the gold ads. First senrene the tell you how much purchasing power the dollar has lost. Second se te ce the tell you how much the dollar price of gold has gone up." Ditch that hand held device for something you know how to use. To guess what you are trying to say here, is near impossible. The distorted measure (i.e., the CPI) of the distortion of the market (i.e., inflation) created by a corrupt entity (i.e., the government) to justify its continued distorting actions (i.e., more inflation) apparently shows that things were worse in the past (when the government was distorting the market). Perhaps you should consider the idea that the government has refined its measuring techniques to better hide its distorting activities. Quote from Benjamin: "...you would still be way down on your "investment" ..."
Gold isn't an investment any more than dollars or euros are an investment. Other than its uses in jewelry, electronics or metal alloys, gold is just another medium of exchange (i.e., money). Money doesn't make anything. When you own an ounce of gold, you will own an ounce of gold. When you own a dollar, all you own is a piece of paper with some arbitrary value completely dependent on an illusion, that can be created (or destroyed) on a whim. Governments create trillions of new dollars and euros and yen with hardly a second thought. Anybody with even the most elementary understanding of supply and demand should understand the potential consequences of such actions. "real" gold prices have more than tripled since 2000.
this same trend and ratio is present in the constant commodity index. these seem impossible results over a period this long. the real issue is that we are using a broken deflator. CPI understates inflation, so we are seeing apparent "real" increases in price as you always will if you use a deflator that understates inflation. use the pre 1992 BLS methodology, and much of this "real" increase disappears. CPI-U claims prices are up 26% since 2000.
old CPI shows a 143% increase which eliminates around half of these "real" gains and seems much more congruent with the massive spikes in nominal commodity prices that we have seen. "I get a kick out of the gold ads. First sentence they tell you how much purchasing power the dollar has lost. Second sentence they tell you how much the dollar price of gold has gone up." Wouldn't be so bad if the damn thing didn't have a habit of changing the spelling AFTER you exit a word. Gotta stop blogging while on the tractor, too. As usual, your inability to be logical shows up in spades. What you are looking at is a chart that tells you very little about volume. The fact that two or three contracts exchanged hands for $850 does not tell you that the average price paid by the average person in January 1980 was around $650, which was not too far from the average price paid by gold purchasers during the year. The point is not what gold has done but where it is now. And while it is very obvious to those of us that have been buying the metals since the bear market ended in 2000 that we could see a nice contraction if the Fed actually pretends to be willing to end QE2, the long term trend is set for some time. Given the problem with fiat money around the globe and the huge political turmoil it makes a great deal of sense to hold a big chunk of one's portfolio in the metals as long as they continue to be under-owned as they currently are. This is what makes markets interesting; differences of opinion. And what makes them profitable for those that are willing to take the minority view. Ever since the PMs bottomed we have been getting guesses of overvaluation and the end of the trend from empty suits who knew far less than they imagined. Every little pullback was seen as confirmation of their views and every rise was seen as irrational. Yet, they missed the run while those of us who were paying attention took advantage of the opportunities that the markets gave us. And while the empty suits dismiss a minor daily gain in silver of $0.45, to pick an example, those of us who saw the picture much clearer and understood the economic inevitability as a 10% gain on our average purchase price. A 20 year real estate market. What kinds of drugs do you use again? You have one in 45 homes in foreclosure, one in four American households with a negative net worth, and more than 6 million people who have given up on finding a job at a time when Obama is running $1.6 billion deficits. How do you get a bull market in equities and real estate out of that? Thinking maybe new money should go into geiger counter manufacturing. Why? Do you plan to take an airplane ride or do you eat too many bananas? I can already tell you that if you do you will see much higher levels of radiation. But the good news is that is not likely to be harmful unless you go through too many TSA checks. The US declared bankruptcy on August 15, 1971 when Nixon closed the gold window. The USD devaluation that followed destroyed most American savers by the time that the late 1970s came around. The USD was only saved by the appointment of Paul Volker, who was one of the people that advised Nixon to close the gold window. Volker imposed a discipline that caused a massive recession that washed away old malinvestments encouraged by the easy money policies of the 1970s. But even Volker admits that what he did could not be done today because the US is a totally different country that is in a much weaker position than it was when it was in the late 1970s. My point is that we can't draw conclusions by cherry picking starting points after the fact and pretending that we would have been alert enough to notice the changes in fundamentals at the time. More than 95% of the people in this world who did purchase gold in the 1970s came out far ahead of the people who did not. OK. Look at the gold/Dow ratio. Or the Gold/Housing ratio and you see that the price of stocks and real estate have collapsed against gold. While some things, like oil, have held their price as measured in gold most others have not. "OK. Look at the gold/Dow ratio. Or the Gold/Housing ratio"
that was not my point. my point was that using CPI as a deflator to calculate the "real" price leads to overstated price appreciation compared to actual price level. if you compare gold to the constant commodity index, it looks pretty similar. Were there any fake, paper commodities like GLD and SLV in 1980? Was there a greater percentage of the market based in real, physical metal compared to today? If not, wouldn't a larger, partially virtual (and falsified) supply drive the price down? Ah. Better. that's what I thought you meant, but I couldn't tell for sure. Aren't those two sentences saying the same thing from two different directions? Both statements are true. 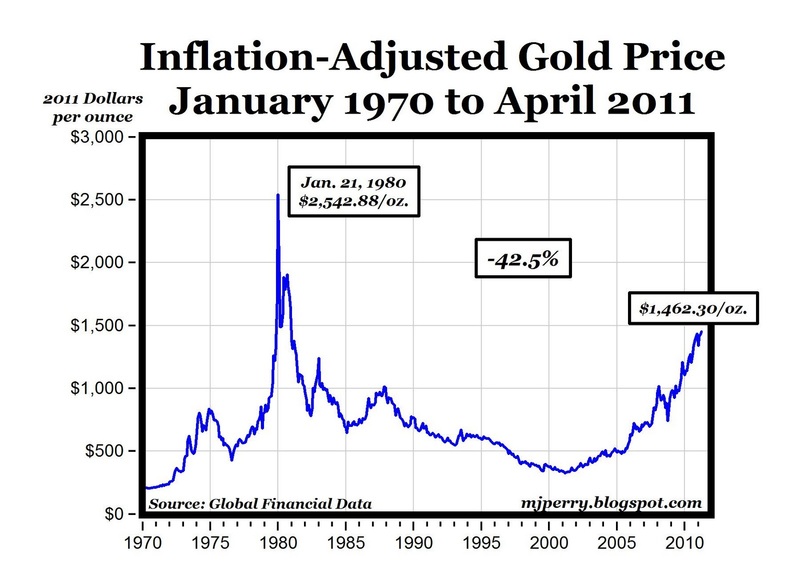 The inflation-adjusted, median gold price for the 1970-2010 period was ~$575. Current gold prices are 150% higher than the 40-year median. The fact that gold prices are below the markedly abnormal 1980 spike means little. The main point I get from the chart is that fears of high inflation have driven the price of gold to 2.5 times higher than the median price. You have been saying the CPI vastly understates inflation. Of course, that means that gold really has not rallied much. Morgan was saying the CPI is really up 150 percent or so, not 25 percent, in the last X years, I think 20. This suggests, if you really believe the CPI radically understates inflation, that gold has not done that well. In fact, if Morgan is right, gold has slightly deflated--buys less, in real terms, except perhaps lately. If you believe Morgan. A 20 year boom in property? I am speaking globally. I can tell you that good farmland two hours north of Bangkok has doubled and tripled in value in the last 8 years. I know of one case, near Pak Chong, in which property that used to sell for 30,000 baht per rai (half-acre) received an offer of 200,000 baht. And China has mouths to feed and rising incomes. India's population is growing. In the US...well, 20 years is a long time. Prices are firming up. Remember, there is more than one asset class in property than housing, you have industrial, retail, offices, etc. I would say that if one is true, the other is (at least partially) meaningless. I suppose it is possible the price of gold went up faster then the value of the dollar went down, which is the point of the "real gold prices" argument. Gold has a lot more uses now, than it once had. I'm a walking gold mine, after all the gold they injected me with. Would it be more meaningful to compare gold to other commodities? Didn't Dr. Perry make that point once, that the price of oil had barely changed, if you priced it in gold? Is that an argument for a return to the gold standard? Does it make any difference? When it comes to making a trade, it is still a question of how much more you value the product than the "money", no matter what form it takes. "I suppose it is possible the price of gold went up faster then the value of the dollar went down, which is the point of the "real gold prices" argument." I could say that the price of gold went up in terms of dollars, and I could say the value of the dollar went down in terms of gold. It is the same thing. "Would it be more meaningful to compare gold to other commodities? Didn't Dr. Perry make that point once, that the price of oil had barely changed, if you priced it in gold?" Yes, pricing commodities in other commodities that have actual value is more meaningful. Fiat money has no value other than what government says it has. When confidence erodes, as has been happening, or government counterfeits money & floods the market with it, the value of the fiat currency decreases in terms of real commodities, including gold. The attraction of gold as money (or any other commodity) is that government can't increase the supply of it at will to finance spending. Quote from Hydra: "Is that an argument for a return to the gold standard? Does it make any difference? When it comes to making a trade, it is still a question of how much more you value the product than the "money", no matter what form it takes." The problem is "money" today is NOT gold or oil or tobacco or some other tangible commodity with actual subjective value. It's meaningless paper, that is constantly produced and inflated at the whim of bureaucrats and politicians. If somebody could just produce gold on a whim, then it would have the same inflationary problems as dollars or euros or yen. But you can't produce gold (or oil or wheat) on a whim. It's a tangible commodity with real (subjective) value, just like the things it's used to buy. Yep. My husband calls it "toilet paper money". "In fact, if Morgan is right, gold has slightly deflated--buys less, in real terms, except perhaps lately. If you believe Morgan." that's a ridiculous straw man. i never said anything of the sort. i said that if inflation has been understated, then real appreciation in gold has been less. but it's still positive. you want to show me where i said that? is your problem inability to think logically and comprehend basic statements or are you just a serial liar that misstates the arguments of others for rhetorical advantage? there can be little question that you consistently misstate the arguments of others (as you have done yet again here) but are you incompetent or unethical.? i'm leaning toward incompetent given the way you often try to back up your own arguments with completely orthogonal data (as on the military thread), but i'm really still not quite sure. keep talking. let's get some more data. "Of course, that means that gold really has not rallied much. Morgan was saying the CPI is really up 150 percent or so, not 25 percent, in the last X years, I think 20." this is also an irretrievably stupid statement that demonstrates once more that you do not even understate what inflation is. gold has rallied a great deal. of that there is no doubt at all. if something doubles in price and CPI doubles as well, that's no real gain, but still an enormous rally. you protected your buying power. if you had held bonds, you would have been mauled. you are acting as though 100% inflation and 100% asset appreciation = zero. it doesn't. further, gold is still up more since 2000 than pre 1992 CPI. can you show me another non commodity US asset class that can make the same claim? bonds? nope. equities? nope. wages? nope. real estate? nope. the dollar has lost 50% of it's value against benchmarks like the swiss franc over the last decade. of interest, if you combine that decline with the pre 1992 CPI inflation rate of 142% over that period, you get a 65% decline in the purchasing power of the dollar which implies that dollar denominated commodities would be up 284% in price which is still below the appreciation of gold but very close to the 250% increase in the constant commodity index. "Yep. My husband calls it "toilet paper money"." There are two ways to look at the data. One way is to show that gold prices are rising (as this chart does). The second way is to assume that gold represents money (as opposed to rectangular pieces of paper) and that we have been in a ten year deflationary period. Given the advent of the internet, freer trade, technological innovations leading to far more efficiencies in the economy, why would we not assume that we have been in a period of real deflation? Overall, prices dropped by 50% during the 1800's in both gold and dollars. We hads the industrial revolution then, the information revolution now. In reality I think we have a convergence of three factors: 1) real deflation due to efficiencies (Good), 2) Poor CPI results resulting in measurement issues, and 3) a herd mentality buying gold because the fed is treating the dollor like toilet paper. Why does the chart only go back to 1970? It would be interesting to see it at least as far back as pre-Depression. Prior to 1971 the dollar was linked to gold. P.J. O’Rourke: "Atlas Shrugged. And So Did I"